Researchers at the USDA Human Nutrition Centre (HNRCA) have found that blueberries rank No.1 in antioxidant activity when compared to 40 other fresh fruits and vegetables. Antioxidants help neutralise harmful by-products of metabolism called “free radicals”, that can lead to cancer and other age-related diseases. Anthocyanin – the pigment that makes the blueberries blue – is thought to be responsible for this major health benefit. In another HNRCA lab, neuroscientists discovered that feeding blueberries to laboratory rats slowed age-related loss in their mental capacity, a finding that has important implications for humans. Again, the high antioxidant activity of blueberries probably played a role. Researchers at Rutgers University in New Jersey have identified a compound in blueberries that promotes urinary tract health and reduces the risk of infection. It appears to work by preventing bacteria from adhering to the cells that line the walls of the urinary tract. A number of studies in Europe have documented the relationship between bilberries, the European cousin of blueberries, and improved eyesight. This is thought to occur because of the anthocyanin in the blue pigment, which is also available in the blueberry. One study in Japan documented that blueberries helped ease eye fatigue. At the recent America Chemical Society (ASC) meeting it was reported that a compound found in blueberries called pterostilbene has “the potential to be developed into a nutraceutical for lowering cholesterol, particularly for those who do not respond well to conventional drugs”, (foodnavigator.com 24/08/04). Study authors from the USDA’s Agriculture Research Service (ARS) indicate that the compound found in vaccinium berries could be a “potent weapon in the battle against obesity and heart disease through its cholesterol-reducing potential”. Head researcher, Agnes M. Rimando and her associates “earlier showed that this compound may help fight cancer”. According to the technical abstract, “These naturally occurring stilbenes, known to be strong antioxidants and to have cancer chemopreventive activity, will add to purported health benefits derived from consumption of these small fruits”. Eating blueberries may help you remember where you placed your car keys – important findings if you’d like to keep Alzheimer’s and heart disease at bay. The chemical that appears responsible for this neuron protection is anthocyanin. Blueberries, along with other colourful fruits and vegetables, test high in their ability to subdue oxygen free radicals. These oxygen radicals, which can damage cell membranes and DNA through a process known as oxidative stress, are blamed for many of the dysfunctions and diseases associated with ageing. Antioxidants are thought to help protect the body against the damaging effects of free radicals and the chronic diseases associated with the ageing process (Ames,1993). Fresh fruits (blueberries) and vegetables contain many of these naturally occurring antioxidants such as vitamins C and E.
Blueberries contain 0.04mg of beta-carotene, 13mg of vitamin C and 1mg of vitamin E per 100g of blueberries. In addition, blueberries contain anthocyanins and phenolics that can also act as antioxidants. Although their modes of action are still poorly understood, it appears that these acids may inhibit cancer initiation. 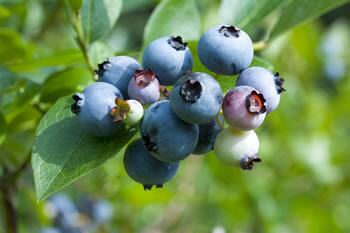 Ellagic acid (in its most biologically active from, ellagitannin) is found in blueberries and some other berries. (Stoner, 1989). Folic acid may help guard against cervical cancer (Toufexis, 1992), and may benefit the foetus during pregnancy. Blueberries contain 6μg./ 100g of folic acid. In Sweden, dried blueberries are used to treat childhood diarrhoea (Kowalchuk, 1976). This use is attributed to anthocyanosides, a natural substance found in blueberries which is believed to be “lethal” to E. Coli.